Will Discourse ever gain ignore user functionality? I’m not talking about the troll he’s talking about in the article. If I get a real hothead like that, I’ll flag. But I’m not going to flag the guy who just gets a little needy, or chatty, that I would, in feature-complete forums, simply ignore. For context, we host nearly a thousand forums, and this “I absolutely must make this person disappear from my view, otherwise I will be very cross” concern barely comes up in practice. That’s how rare it is. I’ll agree that in giant centralized systems this kind of functionality is essential. But bear in mind that the goals of Discourse are “let a million diverse flowers bloom”, not “let one enormous centralized flower bloom and destroy the rest of the garden” ala Facebook. People who can’t abide should be shown the door. "It allows you to ignore bad behavior" - Yes, it does, which is exactly why I want the feature. I have different levels of tolerance for ignoring vs. flagging. Ignoring a poster sends no message whatsoever to all other readers - if anyone infers any such message, it’s their mistake. They can ignore the offender too. "It puts the burden on the user." - This is nonsense. I have no idea how Mr. Atwood derived this interpretation. I have zero responsibility for the offender’s behavior. I have (or want, in this case) the ability to block him out, as most forums I’ve ever used allow. "It does not address the problematic behavior." - Again, I have different standards for ignoring vs. flagging. If I feel the offender’s behavior warrants flagging, I’ll do both - Ignore and flag. It ain’t rocket science. Secondly, I’m not responsible for the offender’s behavior, nor for correcting it. Most offenders, in my experience, act the way they do because they enjoy eliciting a response. If they get no response, eventually they quit bugging me. "It causes discussions to break down." - Typically, the forums I’ve used simply hide the offender’s direct posts from me (as opposed to their text quoted by someone else), and I’m fine with that. Some forum applications, rather than hiding them completely, just collapse them with a header, allowing me to expand them if I need to see them in order to follow the conversation. I’m fine with that as well. There are always alternatives. Again, I have different standards for ignoring vs. flagging. You should be more liberal with flagging. Yes, seriously. It’s the internet; if they can’t abide by your standards, there’s always other places for them to go. Especially since, in my experience, muting doesn’t help. The last time I blocked a user, I still had a pretty good idea what he was doing because everybody else kept replying to him. The temptation to expand his posts and fill in the blanks was too much to resist. I ended up quitting that forum. Depends on what the problem is. If they’re being squeaky-clean in public, but a nuisance in Private Messages, then civilized mute is exactly what you need. For anyone who isn’t a total troll, forcing them to “do it in public or not at all” is probably enough. I don’t find any of the arguments presented in opposition to be compelling at all, but continuing to respond at this point would only be repetition. I’ve made my position clear, and I stand by it, and I stand by my request to add an ‘ignore user’ function. Thanks for your time and attention. @Beckfield - you are 100% correct. MUTE would be an awesome feature. I am not understanding why the counter-arguments are SO STRONG here. Makes me wonder if the technical difficulty (or LOE) of coding the enhancement are that impactful to the core code that all of the banter is a smokescreen as an excuse to not fully vet what it would take to put into play. User has an annoying writing style or formatting. Excruciatingly long-winded replies, repeating the same stories, from the same perspective, using the same language, maybe uses some annoying animated images, or has a signature I’d rather not see. Flag-able - NOT AT ALL. Annoying - for sure. If the user posts enough, it might affect my participation on the board. Again, nothing I would call an admin about, but the board would most likely lose some membership if others are like me. 1 or more users troll EACH OTHER – and only each other. When user A posts, it always illicits a response from user B. Like a bad inside joke. Depending on which user is the worst, I’d like to mute BOTH of them. User only posts about one thing – that I’m not interested in. In this case, this is a sports board, and sure, people are WELCOME to sell equipment, ask about the latest gear, post that they are looking to buy XYZ, or local directors post ONLY when they’re throwing events (in other states that aren’t mine). I want to MUTE these people – their content will never be (or at the moment isn’t) relevant to me. Are those good enough examples? Who knows – but I specifically found this thread, looking for THIS feature, so I could propose THIS software to the man who runs the community as a direct fix for one of our boards biggest issues: ANNOYING USERS. Right now – people pretty much just say the same thing that is being beat over @Beckfield’s head which is: “if you don’t like what they are saying, IGNORE it”. It would be nice if there was a software solution here. 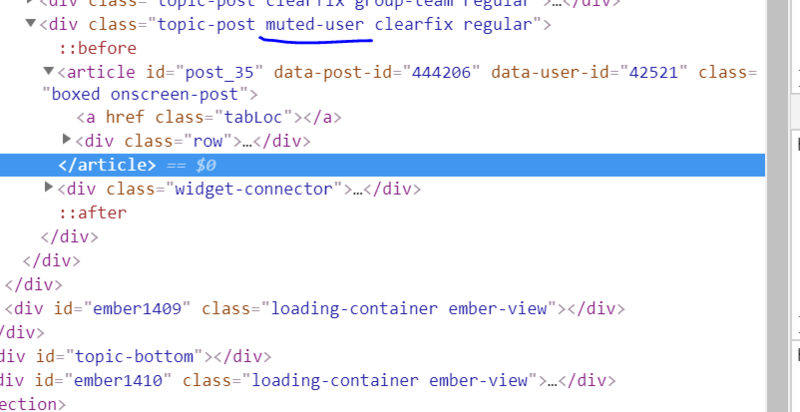 Maybe to keep threads in ‘context’ muting users could see grayed out placeholder of the thread that was hidden (just the title/muted user name and clicking it would not let the user see the content – the muting user can’t have it both ways!) If the muting user wants to see the content, unmute the user in settings. Make it a semi-difficult feature to abuse. And you’re just going to… ignore the problem and let that happen? No! Fix the problem! Makes me wonder if the technical difficulty (or LOE) of coding the enhancement are that impactful to the core code that all of the banter is a smokescreen as an excuse to not fully vet what it would take to put into play. That’s not how we roll. Ever. First, let me thank you for the excellent real world examples. This is exactly what we need to see in discussions about community issues, to properly contextualize the problems so we can have a useful discussion. Excruciatingly long-winded replies, repeating the same stories, from the same perspective, using the same language, maybe uses some annoying animated images, or has a signature I’d rather not see. If it is annoying you enough to take action, it is almost certainly annoying to others and should be escalated to mods. Particularly if it is not a one time or occasional thing but a repeated pattern of behavior that has negative consequences for everyone in the community. 1 or more users troll EACH OTHER – and only each other. Can be legit, particularly if ignore allows self medication and only one other user is actually affected by the behavior, because it is some kind of personal issue between the two. This stuff should be in different categories, subcategories, or tags. Local events and buy/sell/trade are obvious category delineations. So I’d say in two out of three examples here ignore would not be addressing the actual underlying problem, but a flimsy band aid on the symptoms of the problem. Not everyone thinks the way you do, not everyone runs their forums the way you think they should, and not every forum is the same. But full-featured forum applications give clients the tools they need to run their communities the way they see fit. If you only want to market your product to people who are in lockstep with your notion of how to run a forum, I guess that’s your business. But I think you’ll find that your success will be limited as long as you hold to that mindset. You know, I struggle with your reply here, it is not really adding anything to the conversation. Instead what would unlock this discussion is if say 5 communities in the wild that really want this feature funded it in #marketplace, I suspect $500 would do the trick. It is not a trivial change, but it is not particularly hard and as I said before #pr-welcome, we are comfortable shipping with this extra class in core. The problem is that “level of passion” of users that “must have this feature” is strongly not correlated with “level of passion” forum moderators have for this feature. I have a problem, as a moderator, with muting anyone. Every forum will have at least one pair of users who are at loggerheads with each other, but even these users may also have useful contributions outside of their tete-a-tetes with each other. If I have them on mute then I’ll also not be able to see if they post that uploads have stopped working, or that they’ve resolved their issue with their foil. We’ve had users ask about a mute function. Generally those users are ones who can’t resist baiting, or being baited by some other user or group. In practice, I suspect that they would still peek, and respond to, their nemesis. The issue is not that they don’t want to see what the other has posted, what they really want is that the other is silenced. That’s not the discourse way, as I understand it. If an individual is abusive of another member, then they get a warning from me, then at some point the boot. I’m a fairly patient man, but everyone has their limits. Ignore is also an implied Mute. We’ve added a “most ignored users” report which reminds me @khalilovcmd we should also include muted in there, I’d rather have one report that covers both cases and groups rather than a duplicate report. excellent stuff - i have a couple of users who annoy the jaysus out of each other but are both valuable forum members so this will be very useful. Will the “ignoring” user get a PM from the system ahead of time letting them know they should “renew” the Ignore or will they just have to all of a sudden see the Ignored users posts and have to hit Ignore? I am hoping the former. I’d hope the latter, just so that they can see recent contributions since the ignore was put in place, to decide if the ignore is still required. I think there’s something fundamentally wrong with the assumption that people are incapable of change or growth. Well, if the person is Ignoring the other user due to PTSD that the other user us the cause of, seeing anything from them could possibly re-trigger them. I would prefer that not happen. For the individual that’s grounds to reconsider being a member of the community. For the staff that’s grounds to consider excluding the aggressor. An ignore button isn’t enough in those cases. What happens if your session is logged out and you hit the latest posts or a topic only to see their content? If that community doesn’t push the bad apple out, it will be a dead community soon enough. Might as well leave now if the moderators are unwilling to take action. Either a community pushes out the negative, or it withers and dies: http://blog.codinghorror.com/the-bad-apple-group-poison/ http://blog.codinghorror.com/dealing-with-bad-apples/ Ignoring problem users is a short term and short sighted solution.